We, as programmers, often start off reasoning sequentially and then add on reasoning about parallel processes later — usually with much difficulty. Think of producing a control-flow graph for an imperative program, for example. If you have a sequential program, it is usually quite straightforward to form a flow graph for the program. When you try to add parallel processes, you need multiple flow graphs side by side. And they will interact, so really you need to link them together at the points of interaction. It quickly gets quite involved, and leaves you wishing that you didn’t have to involve concurrency. We then wanted to link processes in the tree that communicated with each other, to work out information about dependence and to look at neighbourhoods of connected processes. That was all fine, but gets quickly difficult when you need to consider sequential composition, specifically the sequential composition of parallel compositions. 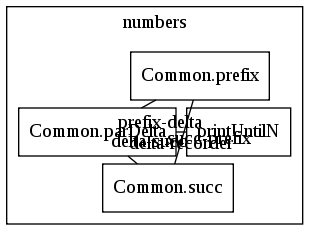 Imagine that one of the tree nodes is first a program without parallel composition, and later becomes the parallel composition of two sub-processes, i.e. P = Q;(R || S). We don’t have a way to represent sequence in our neat parallel trees above, and this causes our representation to become awkward. We can’t have a simple ordered sequential list of trees, because if two processes have sequence information, they can proceed in either order, so really we would need a sequential lattice of trees, which is getting nasty. The key insight is really this: if you are running multiple processes in parallel, it is the same if you start them at the outset of the program, then synchronise with them to start them, as if you set them going when you need them. So even though the process doing c won’t happen until a has, we don’t wait to set that process off partway through the program. We set that process (P3 above) off straight away, then send it a message (par1start) when we want to really set it going. The par1end message makes sure that P1 doesn’t do anything more until P2 and P3 have completed: all three processes synchronise together on the par1start and par1end messages. With this transformation, we never have any parallel composition inside sequential composition in our traces. All we have is one giant parallel composition of every process in the system, where each process is a sequential composition of events. There is no more nesting than that; we have flattened the process network into an unstructured bag of lists of events. In fact, we can now represent the processes as a graph (with links formed by the communications: the dotted lines in the diagram above). 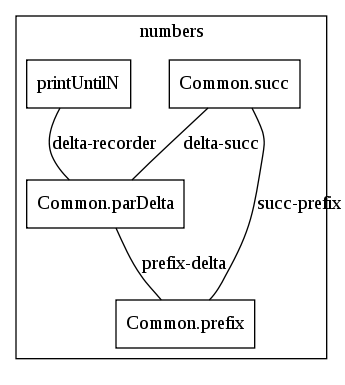 The semantics of the process are unchanged, and all the information about the ordering dependencies is still there if you want it (embodied in the unique parstart/parend communications: the italicised events in the graph above). This form of representation actually makes it really nice to track dependencies and relations throughout the process network, by following the communication links. I’m not sure how useful this is, though. One advantage of CHP’s process-oriented style of programming is that it lends itself well to visualisation. I don’t make as much use of it on this site as I should, but some previous posts show diagrams with processes (as nodes) joined by channels (as edges). I already have some tracing support in CHP, and I had wondered if this could provide a quick and dirty way to graph a process network. This post shows the results of adding a little support to CHP for process visualisation, which I’m now debating whether or not to keep. 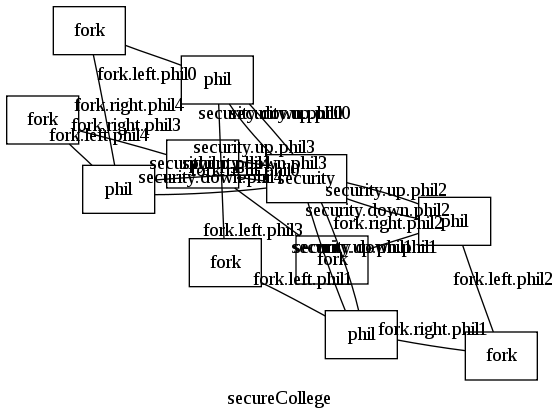 But there is a clear solution for the dining philosophers (a star topology with the security guard at its centre), so if fdp makes a hash of this graph, I don’t hold out much hope for more complex process networks. I don’t want to write my own tool for this, but I may if I have to (I’d actually quite like an interactive viewer so that you can drag things around like you can in prefuse, and perhaps involve animation of the network). Any suggestions for beating fdp into shape, or for alternative tools would be most welcome! The fallacy of drawing the process network in a single image is that it is not static for the duration of the program. Processes can start and end, come and go. Not only that, but CHP channels can be freely communicated down other channels, meaning that programs can dynamically rewire their topology at run-time (I should write some posts about that at some point). So really a proper tool should include support for visualising the process network as it changes over time. But again, that will have to wait for another day.